In the previous particle post the particle generation system was introduced. But after a new particle is created we need to have a way to update its parameters. This time we will take a look at updaters - those are the classes that, actually, makes things moving and living. Updaters also follow SRP principle. They are used only to update particle's parameters and finally decide if the particle is alive or not. We could also go further and create 'killers' - that would kill particles, but probably it would be too exaggerated design. Updater gets delta time and all the particle data. It iterates through alive particles and does some things. The class is quite 'broad' and gives a lot of possibilities. Someone might even point out that it gives too much options. But at this time I do not think we should restrict this behaviour. Ideally an updater should focus only on one set of params. For instance EulerUpdater or ColorUpdater. FloorUpdater - can bounce particle off the floor. AttractorUpdater - attractors in a gravity system. BasicColorUpdater - generate current particle color based on time and min and max color. PosColorUpdater - current color comes from position. VelColorUpdater - current color comes from velocity. BasicTimeUpdater - measures the time of life of a particle. It kills a particle if its time is over. Mixing different updaters is a great thing of course. But please notice that it is also quite efficient. Since we use SOA container each updater uses cache in a smart way. For instance ColorUpdater uses only three arrays: currentColor, startColor and endColor. 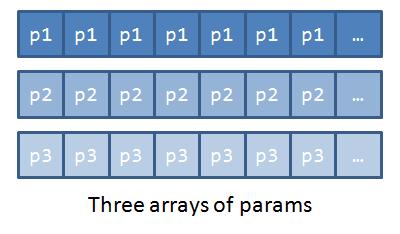 During the computation the processor cache will be filled with only those three arrays. Remember that CPU does not read individual bytes from the memory - it reads whole cache lines - usually 64bytes. On the other hand, if we had AOS container each particle would be 'huge' - one object contains all the parameters. Color updater would use only three fields. So all in all cache would be used quite ineffectively because it would have to store fields that are not involved in the update process. In the second option cache stores also members that are not used during the update process. The problem: of course our solution is not ideal! Sometimes you might have some advanced effect that uses all parameters of a particle. For instance all parameters are used to compute final color. In this case cache will try to load all the params (from AOS) and performance can go down... but I will describe this later when we move to optimization part. Please share any doubts about this design! We have all the systems for particle creation, update and the storage... but what about rendering? Next time I will describe current, but actually simple, rendering system for particles.